The first dedicated satellite for the U.S. Air Force's SBIRS next-generation missile warning system arrived at its Florida launch site last week to prepare for liftoff on an Atlas 5 rocket in early May. 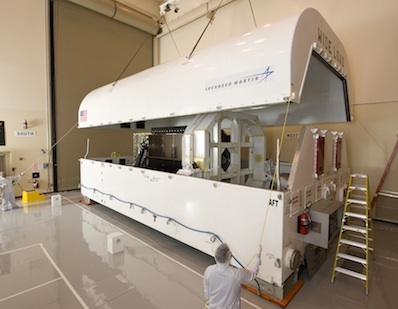 The SBIRS GEO 1 satellite was loaded in a transport container at Lockheed Martin's spacecraft factory in Sunnyvale, Calif. Credit: Lockheed Martin Corp. The $1.3 billion satellite will detect missile launches with ultra-sensitive staring and scanning infrared sensors from an altitude of 22,300 miles. The first of at least four Space-Based Infrared System satellites heading for geosynchronous orbit, the craft flew aboard an Air Force C-5 cargo plane Thursday from a Lockheed Martin Corp. facility in California to Cape Canaveral, Fla. The shipment was two days before an Atlas 5 rocket blasted off with the Air Force's second X-37B space plane. The SBIRS payload is next in line for the Atlas rocket at Cape Canaveral. Launch of the SBIRS GEO 1 satellite is scheduled for May 5. "Shipment of SBIRS GEO 1 is a testament to the strong government and industry partnership, and the hard work and dedication of the entire SBIRS team. We remain focused on achieving mission success for this critical program," said Col. Roger Teague, director of the Air Force's infrared space systems directorate. "GEO 1 will play a vital role in our national security space architecture, and we look forward to getting this satellite on-orbit." The satellite will be prepared for launch inside Cape Canaveral's former Defense Satellite Communications System, or DSCS, processing facility. The Air Force upgraded the facility's infrastructure and built a new access road leading from the base's runway. The SBIRS GEO 1 satellite was unloaded from an Air Force C-5 cargo plane after it arrived at Cape Canaveral. Credit: Lockheed Martin Corp. The car-sized spacecraft will undergo preflight testing, fueling and be encapsulated inside the Atlas rocket's 13.1-foot-diameter payload shroud. Workers will transport the satellite inside the rocket's nose to the Atlas Vertical Integration Facility at Complex 41 in late April for final integrated testing. 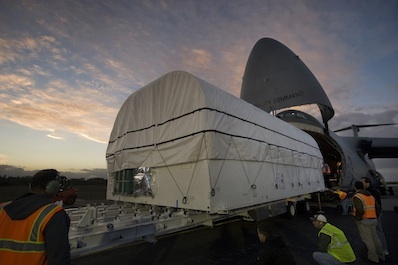 The rocket will roll to the launch pad the day before liftoff. The Atlas 5 launcher will fly in the so-called 401 configuration, denoting a 4-meter payload fairing, no strap-on solid rocket boosters and a single-engine Centaur upper stage. Lockheed Martin is building at least four SBIRS satellites to fly in geosynchronous orbit. The Air Force could order more SBIRS GEO craft. Northrop Grumman Corp. provides the SBIRS program's infrared sensor technology. Two SBIRS sensor suites are mounted on classified National Reconnaissance Office satellites in elliptical Molniya-type orbits over the Earth's poles. The SBIRS program follows the Air Force's Defense Support Program, which launched its last satellite in 2007. "GEO 1 delivery to Cape Canaveral Air Force Station represents the program's most significant milestone to date, and I am proud of the entire SBIRS team dedicated to delivering this cutting edge missile warning spacecraft," said Jeff Smith, Lockheed Martin's SBIRS vice president and program director. "When GEO 1 is launched, declared operational and its data is fused into the DSP and HEO constellation, SBIRS will deliver unprecedented, global, persistent, infrared surveillance capabilities to our nation for decades to come."